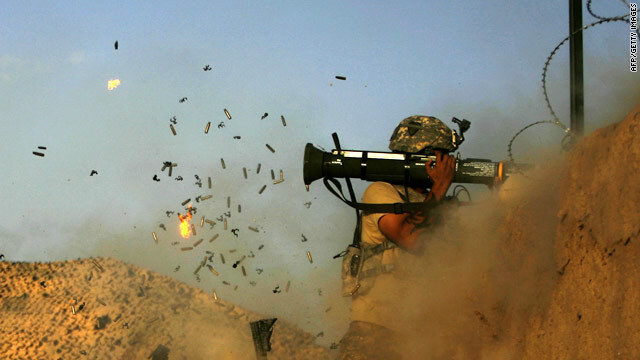 A soldier with the 101st Airborne Division Alpha Battery 1-320th fires an AT-4 during a recent Taliban attack on the outskirts of the village of Jellawar in the Arghandab Valley. The blast coming from the back of the the anti-tank weapon kicks up a cloud of dust and debris - including spent shell casings from other weapons. knowledge is power. and it's true. knowledge can be used in 2 things good and evil. 1. People who have power always telling and spreading "Peace and let's Unite". but they're the one who's backbone of the killings and corruptions. that's evil knowledge (Brainwash).2. people that doesn't have any power (like us. Civilians , loyal citizens)..spreading the word of God city to city and people to people it doesn't matter what religion we are. we have more knowledge and wisdom to the people who has power.we understand everything and we believe in something..Why Us all take the time and reach others arm with love and faith. for the sake for our children and for the future. that's Good knowledge and good heart. we lived for freedom we lived for faith and we lived for hope. 101st Airborne motto: " All the Way" !!!!! Once again the brave troops of the Screaming Eagles 101st division in the thick of the fight. I once served with that division and would proudly do so again. Dear readers and viewers of the CNN Web Site first of all hope ur fine, I have some thing would like to share and u kindly give ur opinion, "The one who know the people who are corrupt in the Afghan government, what he/she can do against such people?" If you all have nothing good to say just keep silence. Another Tea Partier,I presume.You guys never quit,do you? off with the Burqa!!!!! Go France!!!! What is she saying there will only be Burqa and Turban..?. She's not giving a good example, not wearing a f!!!!! !g Burqa and swinging her hips ... Another nice example about wanting to kill ... with an inshallah to go with it? Are you smoking wackey tobacky?